With warm breezes in your face and ten toes in the sand…….it just doesn’t get any better than your own private oasis at Crystal Villas! And unit 11A serves up just the right amount of resort-like ambiance while surrounding you and your group in unparalleled comfort. 11A is the largest townhome available at Crystal Villas. It comfortably sleeps 8…..and it is located right on the beach! It has been recently remodeled in an understated coastal chic style……that welcomes without overwhelming its guests. There are three roomy bedrooms, 2 baths, a fully equipped kitchen and a living and dining area for everyone to gather. Best of all, it sits right on the sugar white sand of the Gulf of Mexico and includes 2 beach chairs and an umbrella (seasonally provided). And that’s just one of this homes’ perks! It also features a recently remodeled outdoor community pool…..or just relax and share a meal on the large balcony. Crystal Villas is located in the highly desirable area of Crystal Beach and just a few minutes from shopping, restaurants, golf courses and attractions. Plus your rental comes with the exclusive Newman Dailey virtual gift card. 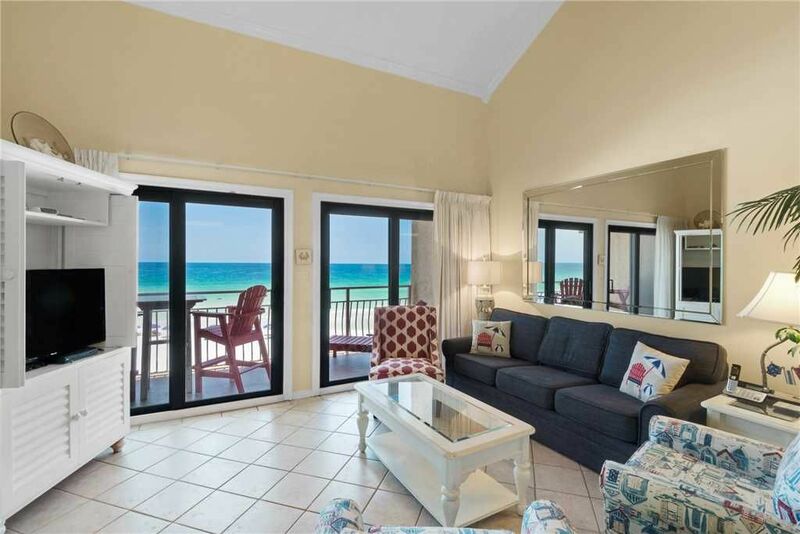 You can’t go wrong with this highly desirable beach property! Call today and make your reservation for the beach vacation you’ve been waiting for! Your toes will thank you for it! We rent weekly year round. During spring and summer we require a Saturday to Saturday stay. We had a great time. Condo was very nice. The pool was being repaired when we were there but we were able to use the pool at another property. We would definitely stay at this property again. So close to the beach with an awesome view from our balcony. We really enjoyed our stay at the Crystal villas 11A. It was the perfect location to satisfy our little ones ages 1-6. The condo is on the beach so walking to and from is not a hassle. Our kids loved the pool too. Restaurants and stores are within reasonable driving distances. The beds were comfortable and the kitchen was completely stocked with any cooking utensil you may need so after a quick trip to the grocery store meals were easy to prepare all week long. I would definitely reserve this place again. We spent a week at Crystal Beach, and we can't wait to go back! This unit is great, completely updated with plenty of room. Our kids, ages 14,10, and 7, loved having their own space upstairs. The beach was not crowded, and it was so nice to be just steps from the beach. We will definitely stay here again over any high-rise condo! Thank you for the great review. It is perfect for a family with kids and especially teenagers! They can totally have their own space. We have excellent fall rates so don't wait until next year to return. Had a great time with my family and the condo was a clean nice size and great views ! Highly recommend to stay here. Our family had a great time, other than having to deal a couple days with TS Alberto. The location was the best! The condo was furnished very nicely. The taste of the water in the condo was a little nasty, but nothing bottled water couldn’t fix... That may have just been an area issue. We would definitely stay here again!